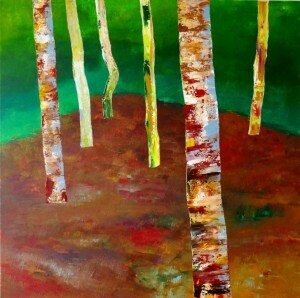 # 10 paintings the Art Shop Gallery, Ilkley for the whole of May 2019. ‘Filey Landing’ – a colourful wooden boat that has the essence of those resting on Filey landing. Varnished acrylic on a 30″ x 30″ block canvas (no frame needed!). Thank you to everyone that has contacted me at Art in the Pen, the Gallery at the Art Shop Ilkley, Craven Arts Skipton, Ilkley Osteopaths and many more directly. Local artists (including me!) are, through membership of Craven Arts, putting on a Christmas Exhibition at Skipton Town Hall. It’s your opportunity to view a wide range of original paintings, sculpture and artwork that could just make that Christmas present you’re seeking even more special. Open daily 1st – 22nd December from 10am – 4pm* pop in and see some great creative work. Putting my back into it! Thanks to Amos and staff at The Ilkley Osteopathic Practice for giving me exhibition space for a couple of my paintings. After a very successful few months with fifteen paintings sold through a couple of exhibitions then the on-line gallery, which usually displays over forty artworks, will be changing with new work added to the existing as and when appropriate. It’s a regularly varying scene reflecting work currently available for sale. My work is usually 76 x 76cm (30” x 30”) square on block canvass (no frames needed) and is generally acrylic that is varnished, signed and strung ready for hanging. People say the work is bold, different, stunningly colourful and eye-catching. Yes my paintings are a visual statement with punch – they aren’t lacklustre. Pleased that the local art shop continue to sell my work and delighted that against some stiff competition at Art in the Pen (where quality improves every year) then, great comments about the impact of my work and its refreshing difference but also sales. Delighted my contemporary paintings will once again be on show at Art in the Pen in Skipton 11th & 12th August. (more details soon). If you’ve not been before enjoy the day (or two) at the show which takes place at the Auction Mart (hence the ‘pens’ for exhibitors) on the outskirts of Skipton. Easy parking, lots of paintings, pottery, crafts and more see and if we’re fed and watered we don’t bite! Thanks to all the customers who popped into my recent exhibition at the Gallery at The Art Shop in Ilkley and bought a painting (someone bought four and they are now in Portugal!). From 30th January to 25th February the “Gallery At The Art Shop” on Hawksworth Street in Ilkley is presenting an exhibition of over sixteen of my paintings. 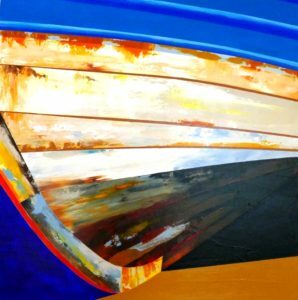 Known for my vibrant canvases my contemporary paintings are based on a series of subjects including fishing boats, fish, shorelines and woodland scenes. Painted in acrylic on block canvas the images are highly colourful and bold. I know people buy paintings because they like them, it suits their taste, they want a statement piece or there is an emotional connection with the subject. Of course my subjects are familiar, but unlike a photograph or a lifelike reproduction, my artwork shows a viewpoint that is both unique and distinctive. The ‘Gallery At The Art Shop’ (open 10 am – 5pm, Mon –Sat) is part of the popular Art Shop in Ilkley well known for artist materials and framing and I’m delighted to be showing my paintings in my local town.